I needed to build 7 corbels for the construction work we are having done. Three large corbels go on the front gable of the house. 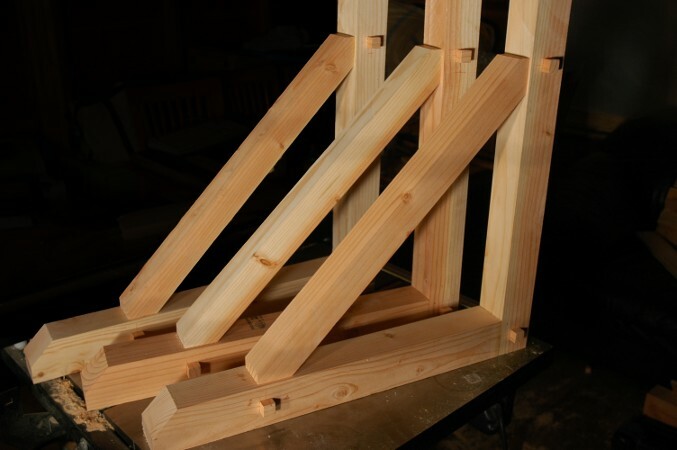 Four smaller corbels go on the new garden shed. The garden shed was built with a ridge board, so there’s no top corbel on the front or back. 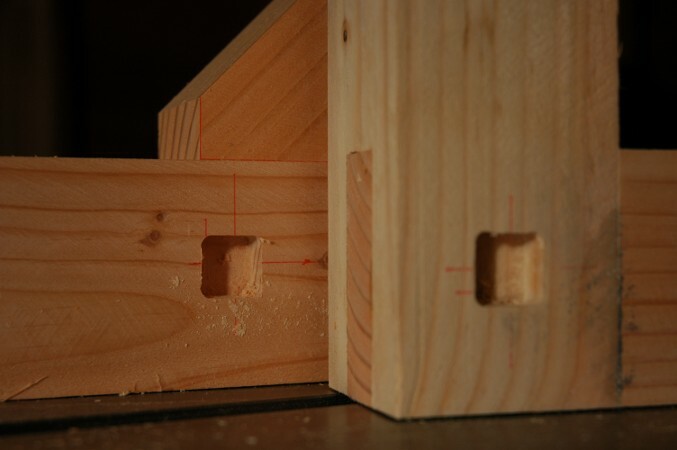 The last corbels I built for our dormer, had through-pegged bridle joints with hand-chiseled square holes and were rather time consuming to build. I wanted to use the same base plans for these new corbels, but with some changes to simplify construction. The new corbels still have a true corner bridle joint (because it’s pretty fast to cut on a table saw and strong), but the hand-chiseled peg holes are gone. Instead, I built a template and used a plunge router and a collar to cut 1/2″ deep peg holes. My contractor said I should just tack on little blocks as ‘pegs’, but by gluing and pinning them in these shallow holes they should resist twisting and splitting with age. 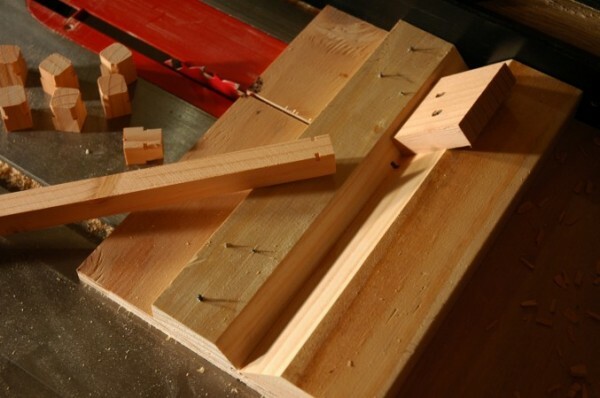 Of course, the glued-in portion of the pegs needed their corners rounded off, so I made a small table saw jig to precisely nick each corner of each peg. The pegs were then cut to length at a miter saw with a stop block. A new addition to my workflow is a pair of 1/64″-accurate dial calipers. Robin probably thought this measuring tool would just make me more OCD, but it actually simplified construction. By eliminating much of the guesswork, it was easier to set up accurate cuts and the pieces came together with less adjusting. I still like our corbel design a lot, but I grimace to think that there are 10 more to build for the house. I am sure it is a pain to make them, but they are lovely, and look great! You house is going to be super fabulous when you are through with it! Old houses need that kind of love to blossom. Thanks. I agree that old houses need this kind of treatment. New construction is so often characterized by the removal of almost every construction detail. The original corbels were very plain and were wrecked when the roof was replaced. I wanted something more craftsman-ish, without becoming excessively decorative. “Tool geek” would be equally valid too. I’m very much a beginner woodworker. I think you have mad skillz…and I don’t mean your Alfred E. Newman impressions. Hi Lee. I don’t know if you will see comments from old blogs, but I am catching up with your posts, and had to comment on this one. Those are really beautiful structures, and I am very impressed with your craftsmanship. Anyone who can build with precision and fine detail gets my admiration. Well done. Thanks! They are definitely not furniture-grade precision, but I was pretty happy with how they turned out. I’ve got the whole process worked out at this point, so if I don’t lose any of my jigs I should be able to build the remaining 9 without as much effort.